Our customer Jonathan was dismayed to open the case to his Yamaha jazz box one day and see this horrible sight. 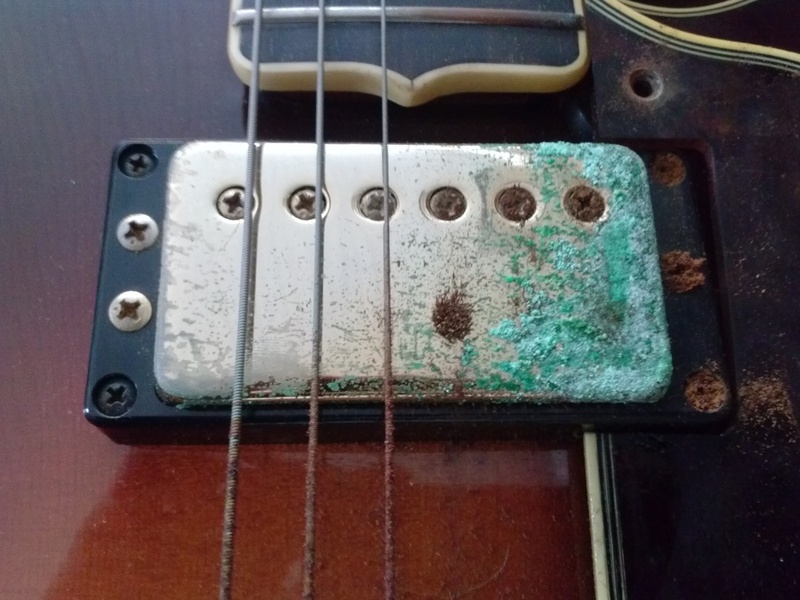 Every piece of metal near his pickguard had corroded, the closer to the pickguard, the worse the corrosion. What's happened here? This particular pickguard is made of celluloid, one of the earliest forms of plastic. It can look very beautiful and make imitations for tortoise shell and ivory, but is very unstable. Celluloid has been used in the past to make pickguards, binding, picks and other small plastic parts for guitars. As it ages, celluloid begins to break down and emits a gas that can corrode metal parts like hardware and even frets. When this happens inside of a guitar case that has been closed for sometime, the gas is trapped and therefore becomes more concentrated and causes the symptoms we see here. This hardware was too far gone so Brad replaced these parts with new nickel plated components. He installed a Seymour Duncan Jazz at the neck and '59 at the bridge, and modified the existing coil tap push/pull pot wiring so that Jonathan would have quiet operation when using both pickups tapped. A new bridge, miscellaneous screws ,and hardware, a setup and this guitar is looking and playing beautiful again. We left the pickguard off obviously because it will continue to gas up. If you know you have celluloid parts on your guitar, one thing to do is to air out the case and guitar often. These gases need to dissipate so that they don't become concentrated. 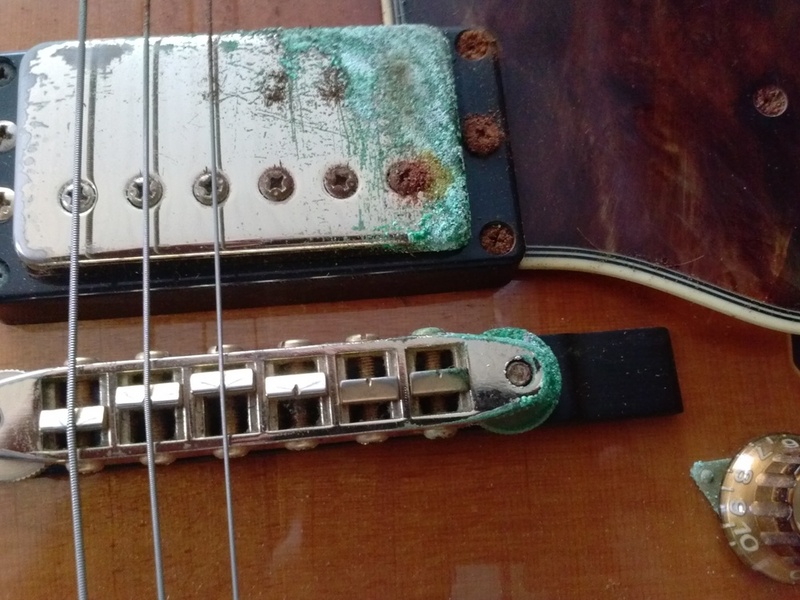 If this has already happened to your guitar in the case, even after removing the celluloid parts, these corrosive elements can linger in your case. You may not want to store it in that particular case anymore.